The Interwrite Mobi interactive tablet can be used in a variety of ways. If the instructor uses the tablet in “sandbox” mode, the entire class can collaborate on a project. In “split screen” mode, the instructor might have several students or several groups of students working on the same problem and displaying the progress on the screen. And, of course, the instructor can use the mobi tablet as a regular interactive tablet. AC outlet. 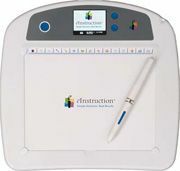 It has a 2.4-inch built-in color display that, when used with the Interwrite CPS, shows student responses to questions on the tablet. The tablet integrates with Examview softview, and teachers can use up to seven student mobis at one time. CONS: It still uses a rechargeable pen, which could run out of power before a lesson is over. OVERALL IMPRESSION: This is the best interactive tablet I’ve seen so far. Since multiple students can participate at the same time in their own workspace, this system more or less makes the idea of expensive interactive whiteboards obsolete.